The day that Sophie was born was one of the happiest in my life. 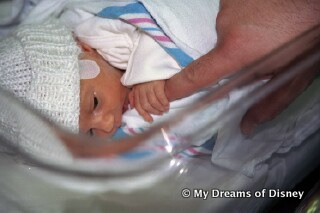 Such a small bundle, scarcely four pounds, just 17 1/2″ long, and born seven weeks early. Cindy and I left the hospital after being in for five days, but the hardest thing we ever did was to have to leave our baby behind — Sophie didn’t come home until she was two weeks old. Even as a premie, Sophie was a strong willed little girl. She pushed off her breathing apparatus constantly her first night, until the doctor finally said, let’s see how she does without it. She’s never needed oxygen since. Over the years, as our love of traveling to Disney World has increased, one thing we have loved to do is take Sophie to Disney for her birthday. So for our last trip, we decided that we would have one more surprise for Sophie and Anna Jane. We decided, with Sophie turning 10 years old on Father’s Day, that it was time for Sophie and Anna Jane to experience the Bibbidi Bobbidi Boutique. On the day of our appointment, which was Sophie’s birthday, we were running a few minutes late, so it was decided that I would take the girls ahead since we didn’t have bags to get checked, and we made for the Castle to make our appointment. It was then that I told Sophie and Anna Jane where we were going, and I’ll never forget Sophie’s reaction. She said to me, “Daddy, thank you so much for my birthday surprise. I’ll never forget it.” She went on to tell me that at least twice more throughout the day. So, our girl went from an itty bitty little thing, to our Disney Diva princess, as you can see below. Thank you all for sharing in my little girl’s birthday! So, in the space of an hour, my beautiful princess was transformed into a Disney Diva Princess! While the price isn’t cheap, the benefit was something that will last a lifetime. We won’t do this every year, certainly, but it was worth every penny, and we will do it again for special occasions. Image via CrunchBaseHave you ever purchased anything off of Yardsellr before? If not, then this deal is for you. Yardsellr is a special website where people can post items that they want to sell. You can access it on their website, or you can access it through Facebook as well. I have found several things and purchased them off of Yardsellr, and I have not had any issues at all with the delivery of my items. The site is safe and secure, and is great for small purchases that you want to make. If you are interested in trying them out, I have a link here that will automatically provide you with $5 free to spend, so what have you got to lose? If you are interested, click the link above to get started. Have fun! By the way, the Adventureland pin was purchased with a free gift like the one that they are offering to you with the link, and only cost me $1.00!